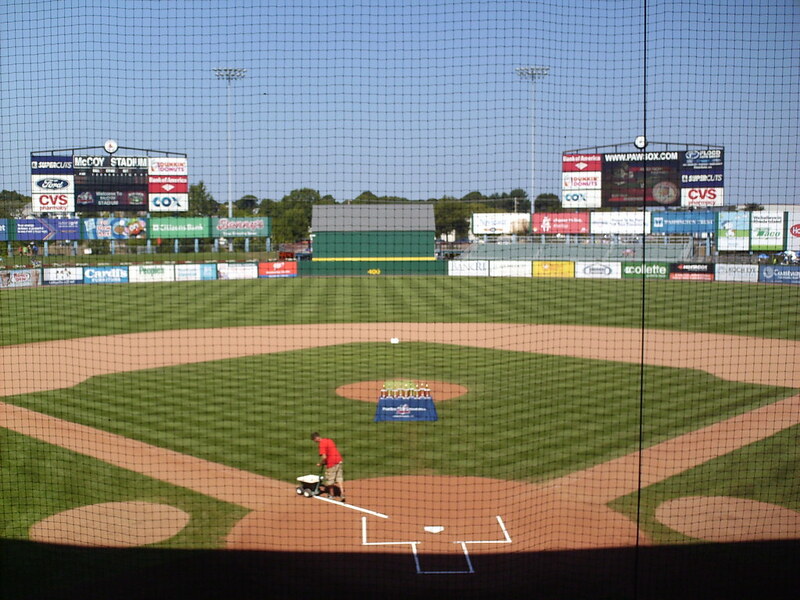 The view from behind home plate at McCoy Stadium. 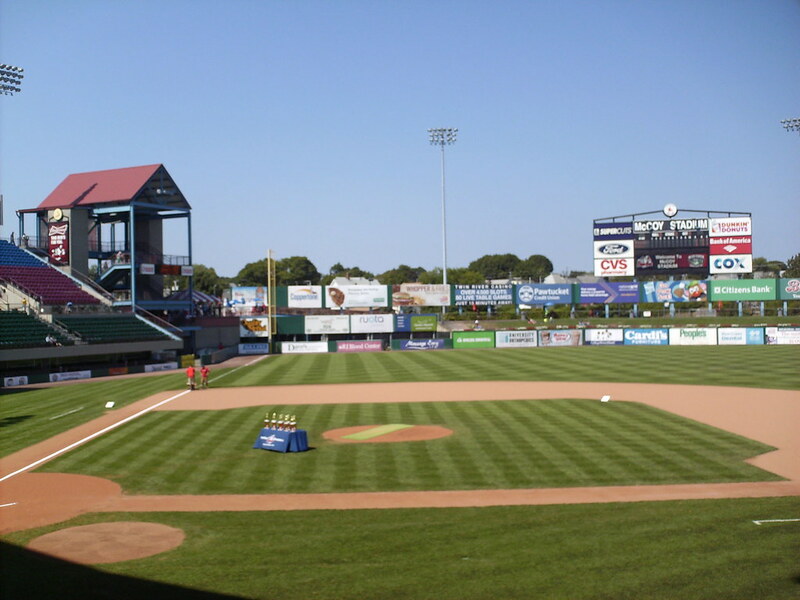 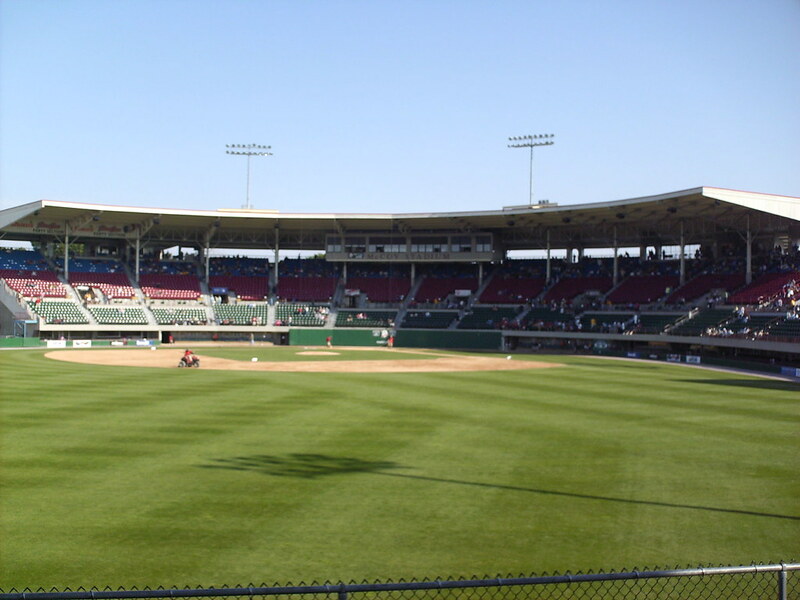 The grandstand at McCoy Stadium, as seen from center field. 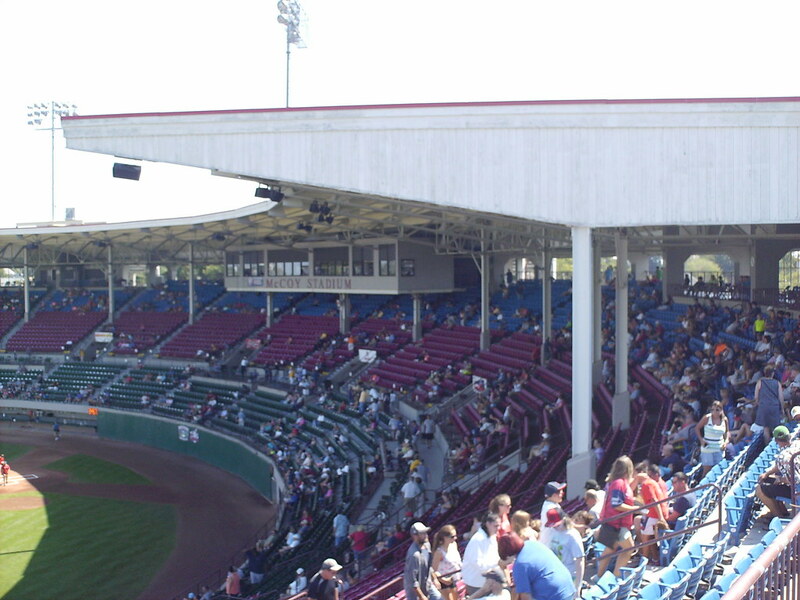 The wooden roof extends out over most of the grandstand, and support poles run through the seating bowl creating a few obstructed view seats. 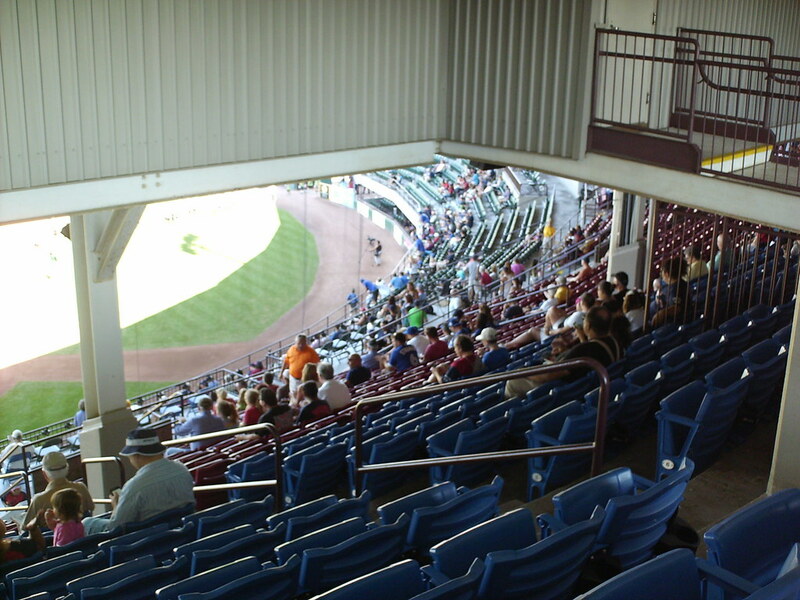 The pressbox sits tucked into the back corner of the grandstand, underneath the roof behind home plate. 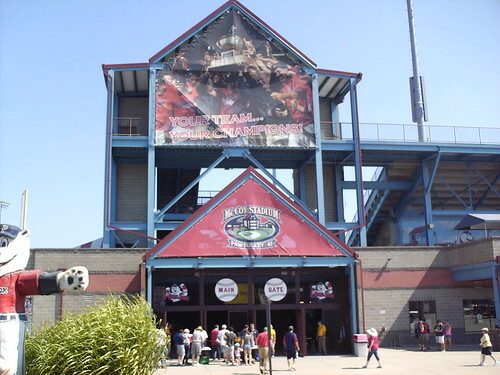 The pressbox was not part of the original stadium structure so it literally sits right on top of the seating bowl. 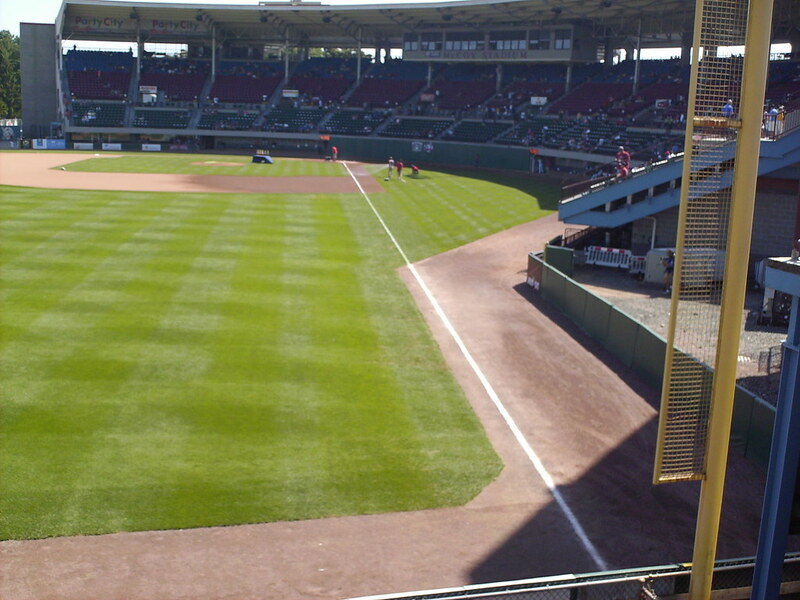 Some seats are located behind it and offer no real view of the field at all. 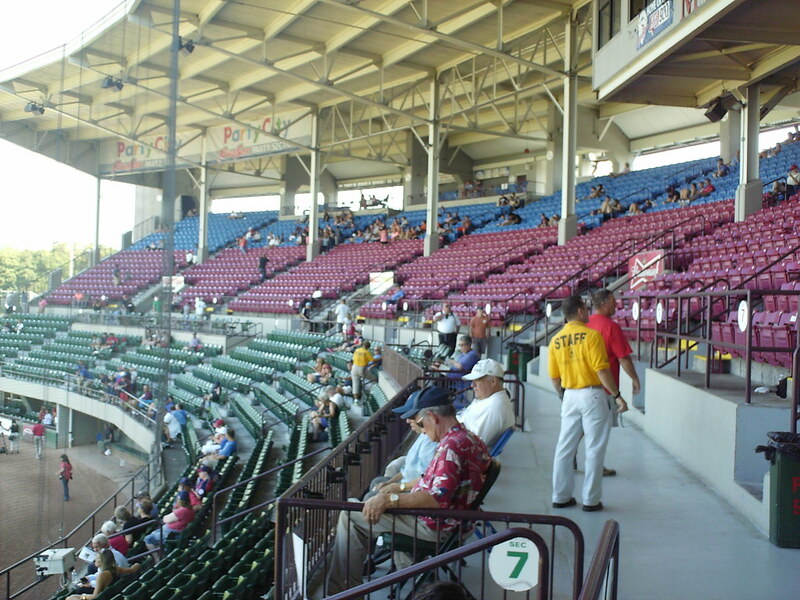 The grandstand features three levels of color-coded seating, with general admission in the upper blue seats. 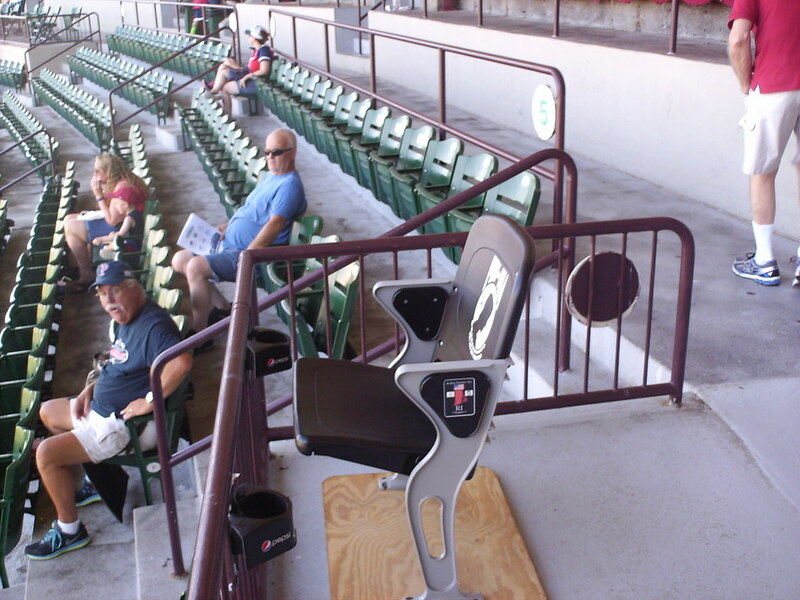 A single reserved POW/MIA seat sits in the handicap seating box along the grandstand walkway. 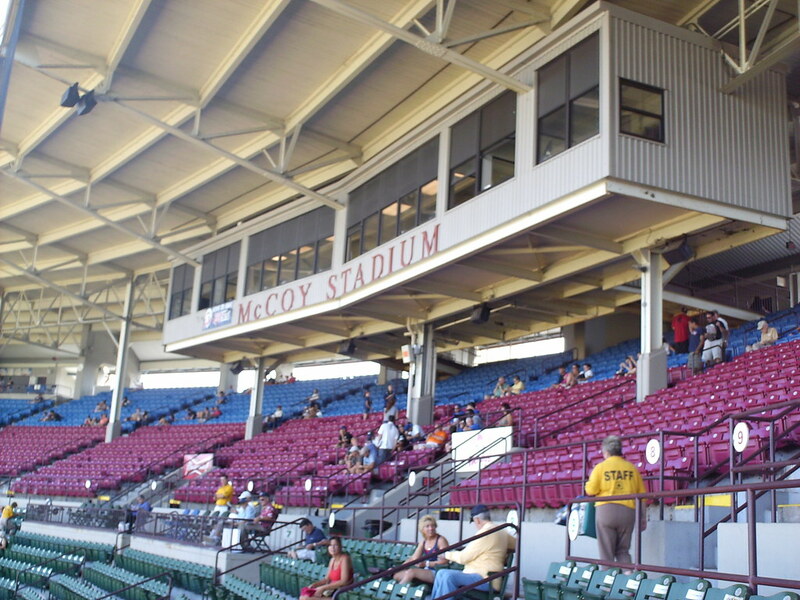 The luxury boxes at McCoy Stadium are located at field level, underneath the main grandstand. 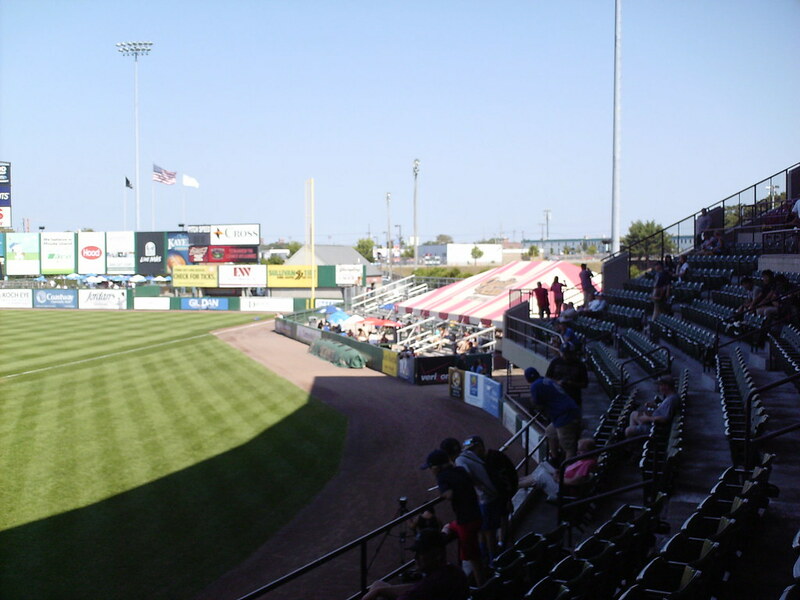 A group party tent and several small aluminum bleacher sections sit down the first base line. 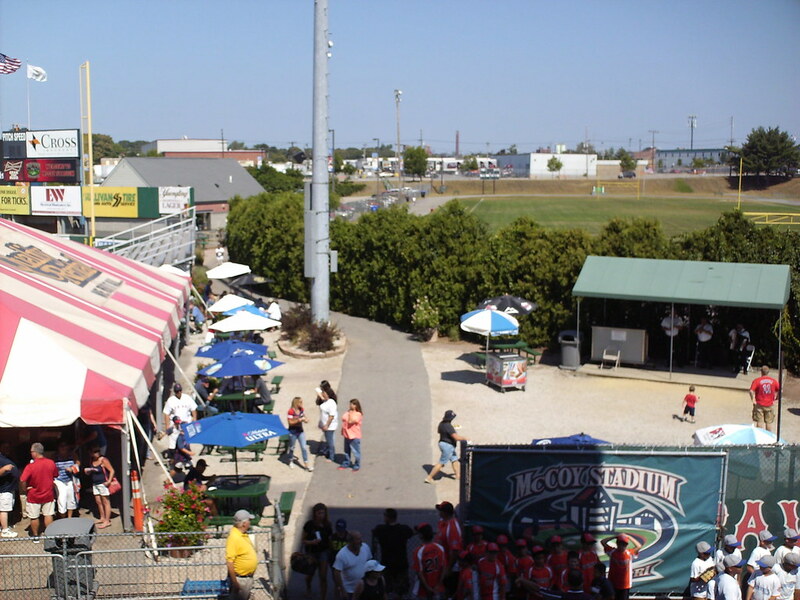 A performance stage and plaza area behind the first base party tent backs up against a local high school football stadium. 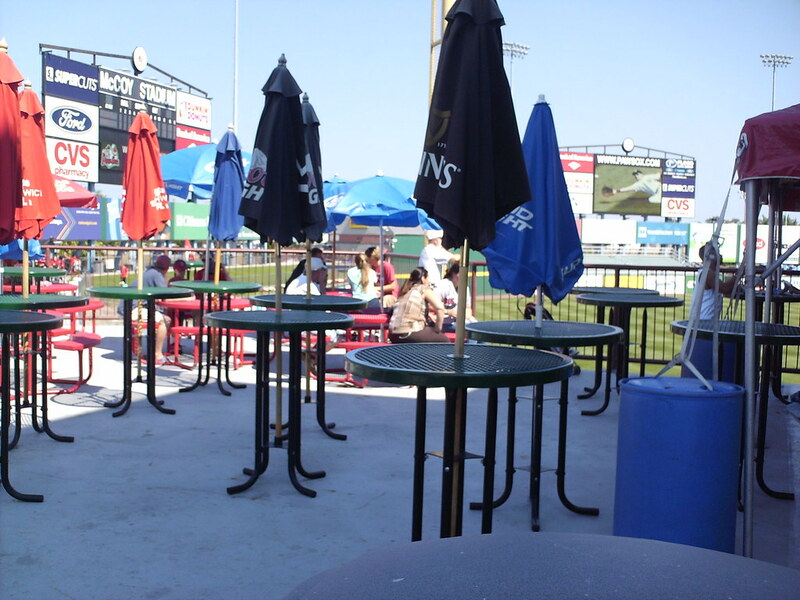 Picnic tables and small tables with umbrellas wrap around the left field foul pole. 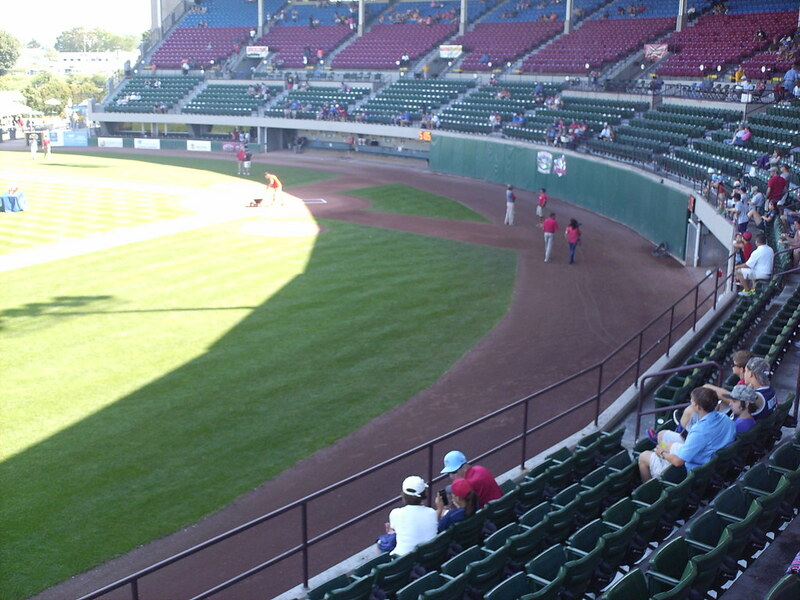 A large bleacher section and group seating area sits beneath the videoboard in right field. 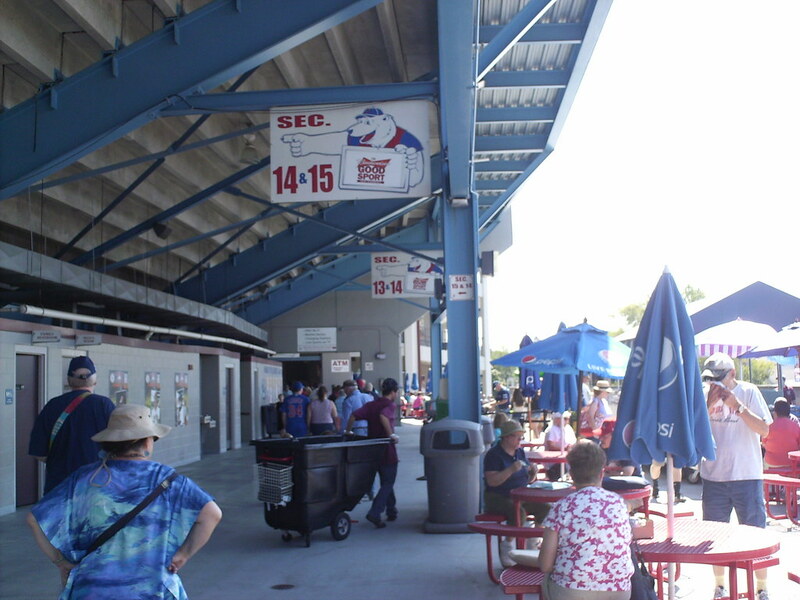 The main concourse, underneath the concrete grandstand, at McCoy Stadium. 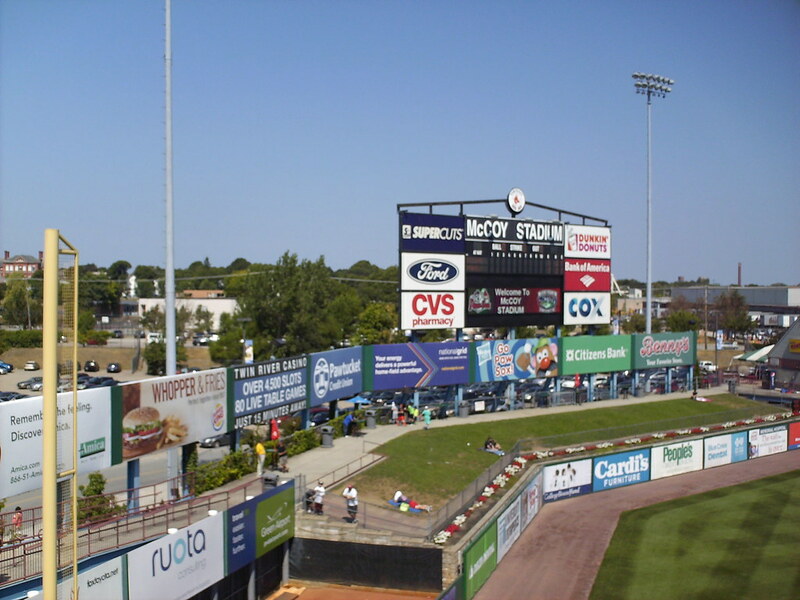 Banners wrapping around the outside of the ballpark celebrate former PawSox players who have made the major leagues and some who have gone onto the Hall of Fame. 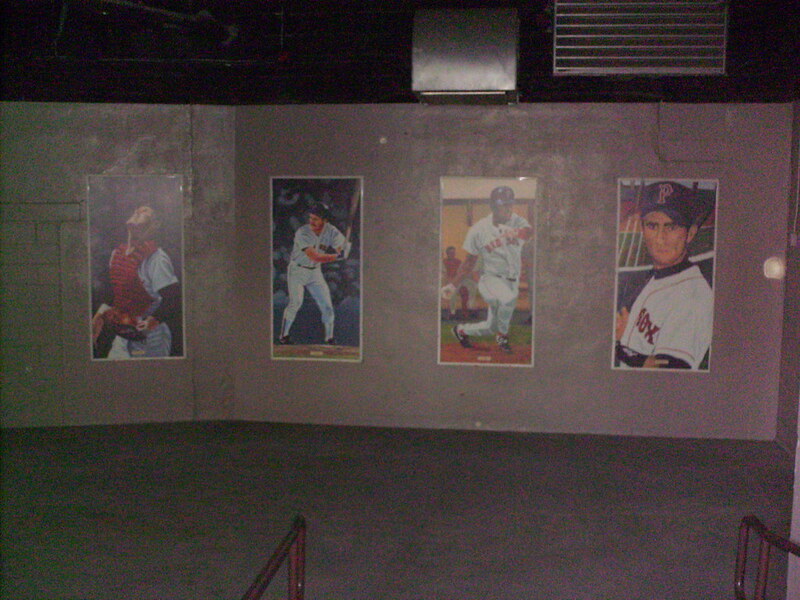 Paintings of former Pawtucket Red Sox players line the concrete spiral ramps that once acted as the entrance ramps to the stadium. 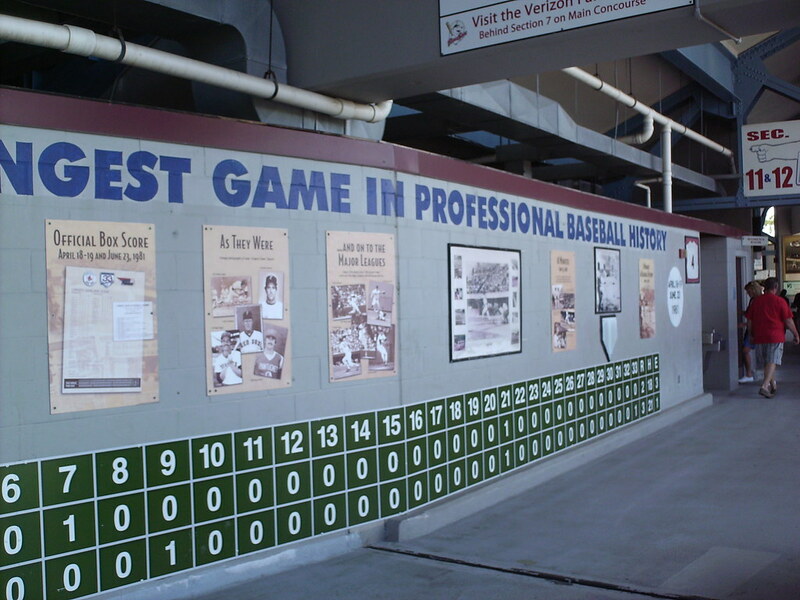 A mural on the main concourse celebrates the longest game in professional baseball history, played at McCoy Stadium in 1981. 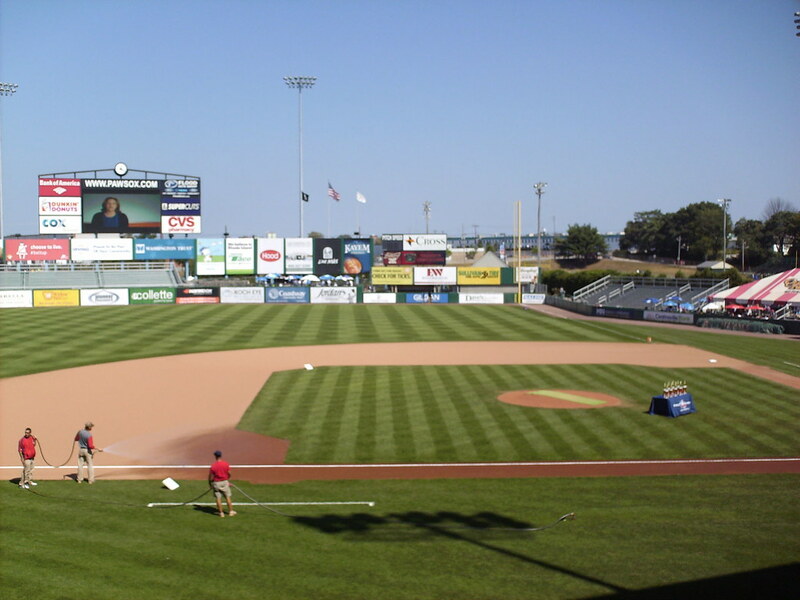 The park features small slivers of foul territory in the outfield corners, opening up to huge round foul areas along the infield. 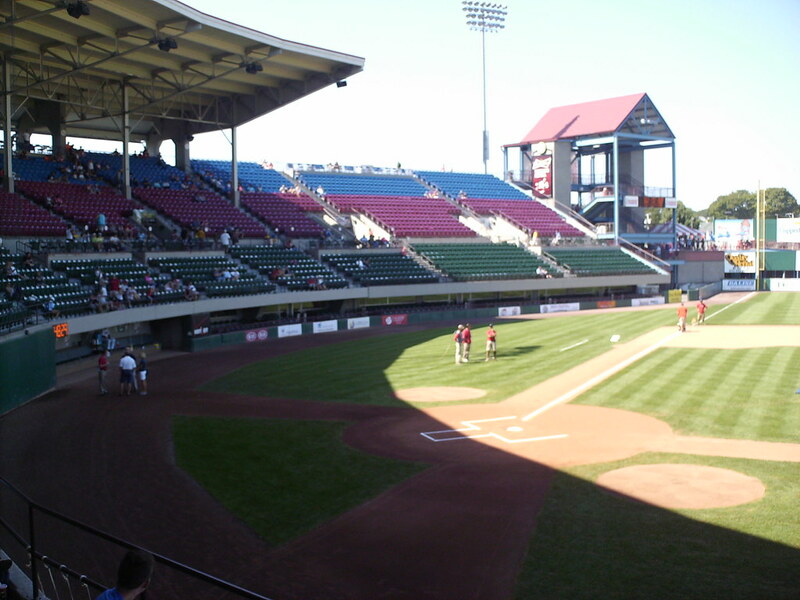 The stadium features a very tall backstop, with the seating bowl sitting on top of it and the dugouts at field level. 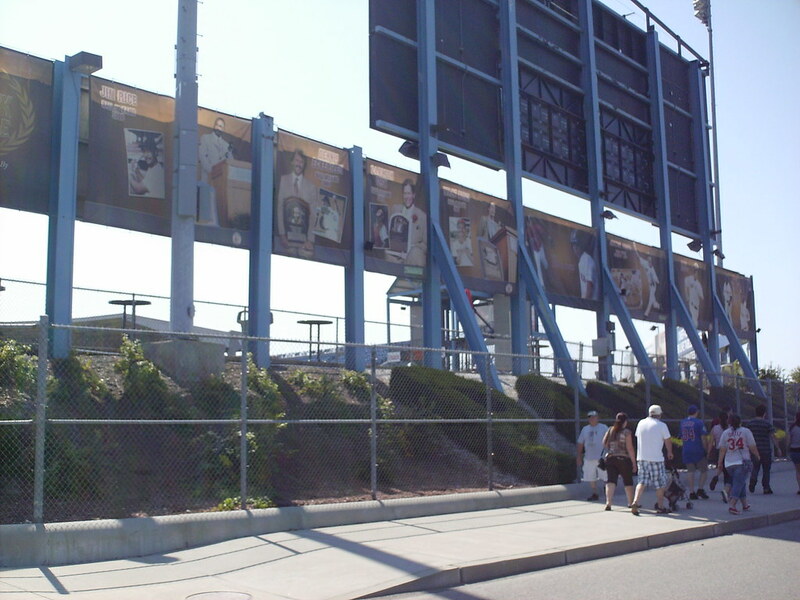 Fans lower buckets into the dugouts to go "fishing" for autographs. 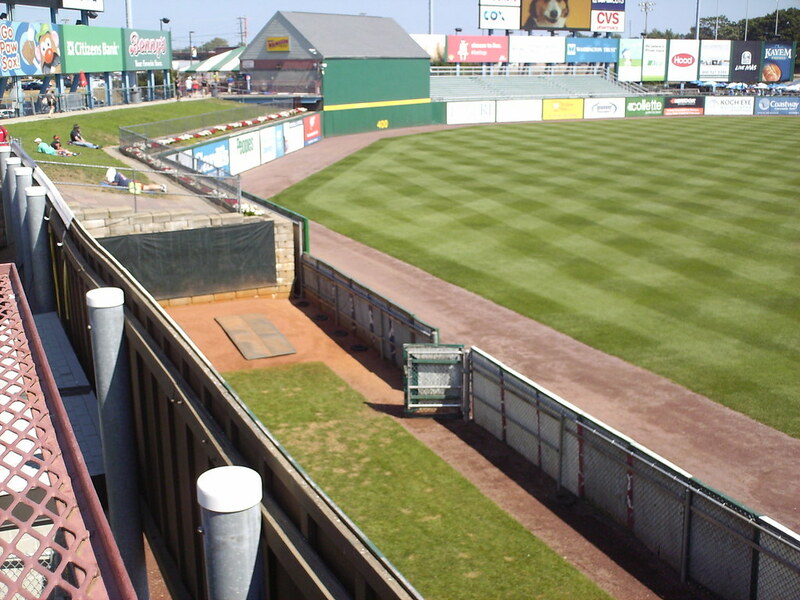 The bullpens sit in the outfield corners, and the fence is shorter in front of them than along the rest of the wall. 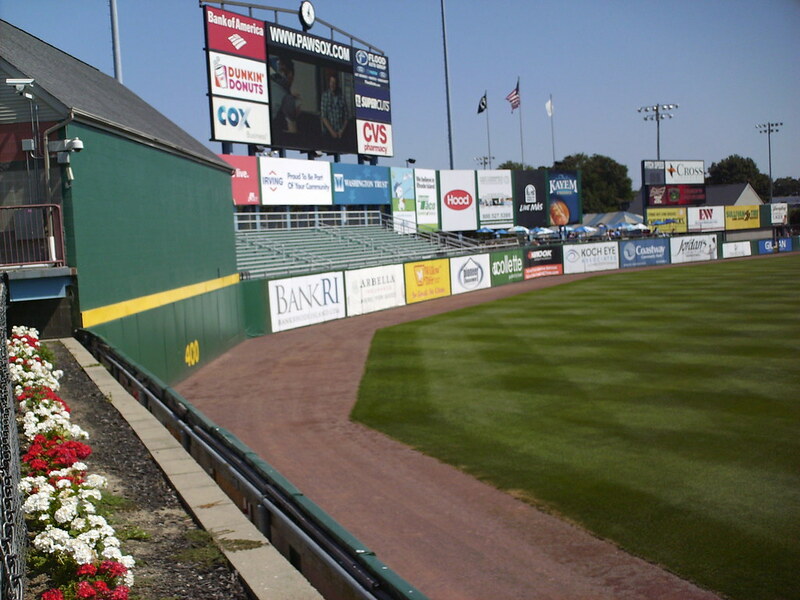 The outfield wall makes several sharp corners as it wraps around the field, and a concession shed serves as the batter's eye. 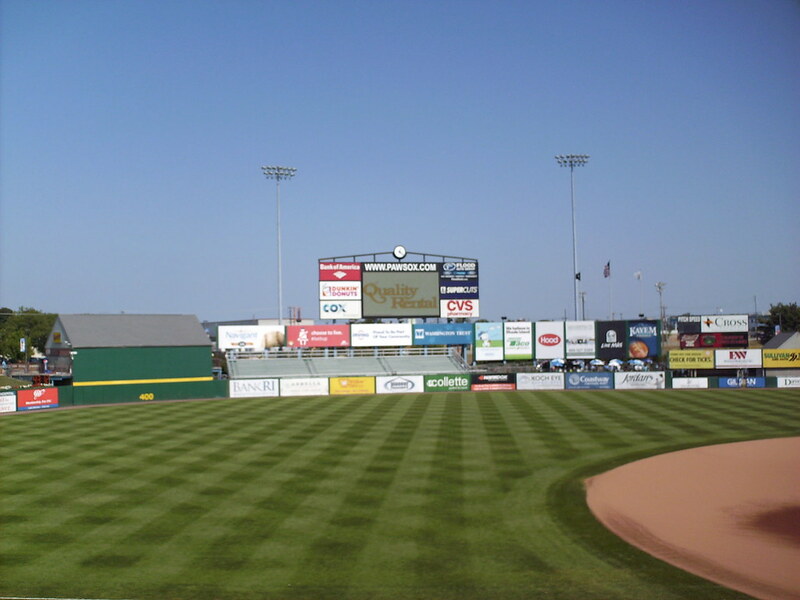 The scoreboard and small outfield berm in left field. 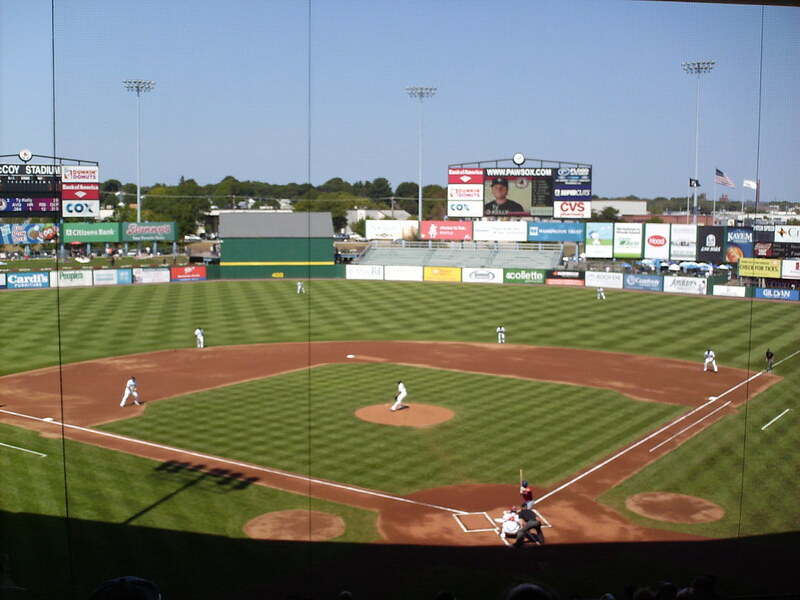 The Pawtucket Red Sox on the field during a game at McCoy Stadium.